“The American Botanical Council’s vision is that the public makes educated, responsible choices about herbal medicine as an accepted part of healthcare. ABC supports this vision through its mission to provide science-based and traditional information to promote the responsible use of herbal medicine. ABC serves all populations interested in herbal medicine: the general public, healthcare professionals, researchers, educators, industry, media and government. Consequently, ABC offers a wide variety of programs and services to fulfill its mission and meet the needs of those it serves. Sharlene Peterson, President of Genesis School of Natural Health, has an individual membership with the ABC and recommends this membership to students. 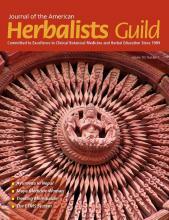 The American Herbalists Guild was founded in 1989 as a non-profit, educational organization to represent the goals and voices of herbalists specializing in the medicinal use of plants. Our primary goal is to promote a high level of professionalism and education in the study and practice of therapeutic herbalism. This highly professional organization is an excellent source of information. Genesis is a school member. Our educational standards exceed most distance-learning natural health school programs. Accreditation is voluntary and does not carry any influence for those who receive diplomas. At Genesis we operate under a code of ethics and a mission that prohibits us from offering programs that are not worthy of accreditation. Genesis has not, and is not, seeking accreditation through the U.S. Department of Education. What does Accreditation mean for non-traditional, natural health programs and schools? We created a BLOG post to simply the frequently asked question: ARE YOU ACCREDITED? Will You Qualify for Board Certifications? Yes. Do I need to be Board Certified?